From the New York Times bestselling author of Always and Blackberry Winter, a sweeping World War II saga of thwarted love, murder, and a long-lost painting. In the summer of 1942, twenty-one-year-old Anne Calloway, newly engaged, sets off to serve in the Army Nurse Corps on the Pacific island of Bora-Bora. More exhilarated by the adventure of a lifetime than she ever was by her predictable fiancé, she is drawn to a mysterious soldier named Westry, and their friendship soon blossoms into hues as deep as the hibiscus flowers native to the island. Under the thatched roof of an abandoned beach bungalow, the two share a private world—until they witness a gruesome crime, Westry is suddenly redeployed, and the idyll vanishes into the winds of war. 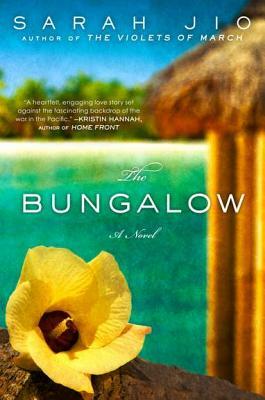 A timeless story of enduring passion from the author of Blackberry Winter and The Violets of March, The Bungalow chronicles Anne's determination to discover the truth about the twin losses—of life, and of love—that have haunted her for seventy years. Sarah Jio is the #1 international, New York Times, and USA Today bestselling author of eight novels. She is also a longtime journalist who has contributed to Glamour, The New York Times, Redbook, Real Simple, O: The Oprah Magazine, Cooking Light, Woman’s Day, Marie Claire, Self, and many other outlets, including NPR’s Morning Edition, appearing as a commentator. Jio lives in Seattle with her three young boys.